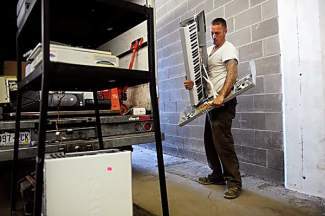 DENVER - JUNE 19: Jay Holmes breaks down an electronic keyboard to be disasssembled and recycled at Denver Metro Computer and Electronics Recycling on June 19, 2013. A ban on throwing out electronics takes place July 1. Looking out at the stockyard in front of his warehouse, Scott Dassler ticked through a list of how almost everything in front of him could be recycled, from the power lines to the metal siding to the wood fence posts, if someone put forth the effort to shred them. If they don’t already, Colorado consumers will have to start taking recycling seriously once a new ban on the disposal of electronics goes into effect July 1. Under the ban, Colorado residents will no longer be able to throw old or unwanted electronics, known as e-waste, in the trash. While phones can still be thrown away, prohibited items include television sets, laptops, tablets, DVD players and video game consoles.